12th Annual Edmonton Rocky Mountain Wine & Food Festival & A Giveaway! It's that time of the year again! For the 12th time in Edmonton, the Rocky Mountain Wine & Food Festival is back! As in previous years, the Shaw conference centre will be hosting Edmonton's Festival with an extensive variety of wines, scotch, premium spirits, imports and micro-brewed beers. Certainly, there will be food as well from hotels, local restaurants and local food purveyors! Liquor Depot will once again feature an on-site liquor store, where attendees can purchase their favourite finds from the weekend. Liquor Connect will also be available to demonstrate how LiquorConnect.com can help find sensational sips after the Festival. Additionally, Sunshine Village will be sponsoring the Grand Prize All-Inclusive Weekend Getaway for two, including two nights accommodation at Sunshine Mountain Lodge, VIP parking, a $100 gift certificate for food and beverages, a couple’s spa treatment and next day lift tickets. 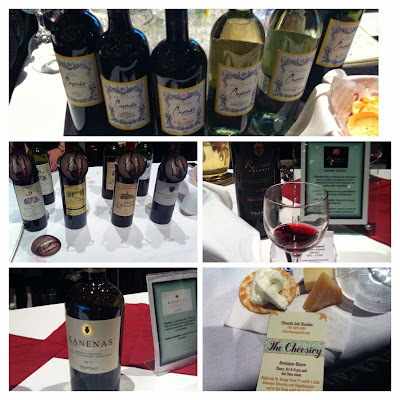 Last year when I had the opportunity to attend, I tried some delicious wines, beers, and food items. I hope you can attend! This year there are three times that you can attend. Friday, October 25, 5-10 p.m. New hours! Saturday, October 26, 12-4 p.m. New session! Saturday, October 26, 6-10 p.m. New hours! Now, the exciting part! You too can attend as I have been given 2 pairs of tickets to give away for the Saturday October 26 afternoon session (12-4pm)! This is a new time and will be way less crowded! The tickets will give you entrance to the festival, but you will need to purchase sampling coupons for food and wine/beverages at $0.50. To enter the give away, please leave me a comment below about: "Which wine, beer or spirt you are looking forward to trying." Only those with comments will be entered into the draw. The comment box is below the Rafflecopter widgit. - Tweet "Enter @beyondumami's giveaway to win a pair of tickets to @RockyWineFood Fest Sat Oct 26 afternoon #yegfood". Winner will be chosen at random and announced on October 23. Good luck! Samples range from 1-20 or more coupons depending on the item. Prices per sample are set by exhibitors. Coupons must be purchased with cash only inside the hall. Tickets are not transferable to another session. This is an adult only event. All attendees must be 18 years or older. Minors (including infants) are not permitted to attend. I'm looking forward to the new Alley Kat brews ! @habanerogal mm..yes me too! Did you try their summer citrus twist? I got the sampler pack last week and that was good! Looking forward to finally trying Alley Kat's Pumpkin Pie Spiced Ale! Ooh that sounds great! Will have to look out for it. Would really like to try Lamarca Prosecco from E & J.
I really want to try the Inniskillin Sparkling Vidal Icewine! Sparkling wines are always great! I'm sure there will be lots of ice wines to try! Definitely looking forward to trying the Alley Kat "Pumpkin Spiced Ale"